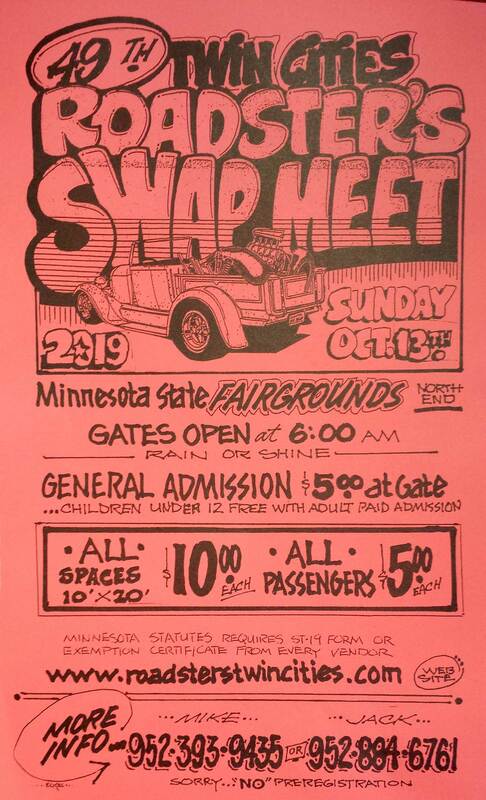 October in Minnesota means it’s time for the annual Twin Cities Roadster's Swap Meet. This year marks the 49th year we have hosted this event it will be held on Sunday, October 13th. Again at the Minnesota State Fairgrounds. All gates open at 6:00 A.M. In 2018 we had over 500 vendors from 7 states and Canada. Remember, it’s Minnesota and “mama” just reminded a lot of guys that her car IS going to be parked inside this winter so “get that —- out of here”. This is one of the few remaining traditional automotive swap meets where builders and restorers can still find some early car parts and typically at reasonable prices. Admission remains at $5.00 each and there is free parking. Please enter the fairgrounds at the Main gate from Snelling or South gate from Como. Remember that the Minnesota State Fairgrounds does not allow parking on the grass. If you do park anywhere on the grass you are doing it at your own risk. Vendors pay a $10.00 admission fee and get ONE free swap space (approx 10×16). If additional spaces are required, they are available at $10.00 each. There is no pre-registration. We have a special parking area inside reserved for pre-1975 rods, customs, restored vehicles etc. (not daily driver beaters). 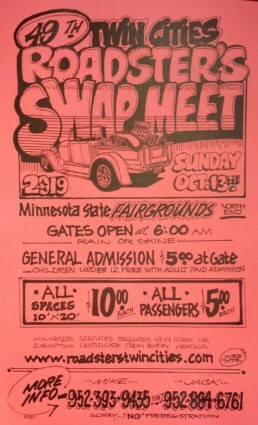 Please enter the fairgrounds at Main gate from Snelling or the South gate from Como and the swap area at gate from Underwood. For anyone DRIVING a pre-1949 ‘open’ car, the admission is FREE! That’s because it’s what the Twin Cities Roadsters are all about.